Personalized black & marigold 64” arc mulligan golf umbrellas are getting attention due to their impressive color profile and extra good sheltering features. 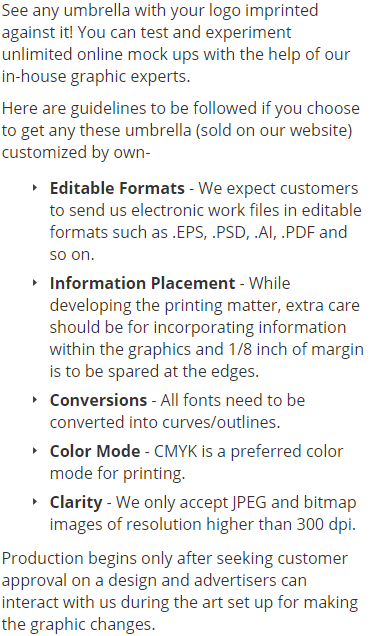 The combination of black and marigold is not one of the most commonly employed, but it’s definitely a typical choice for marketers who wish to create a very distinct impact. Promotional black & marigold 64” arc mulligan golf umbrellas can be largely favored by marketers in healthcare, fashion, cosmetics, beauty care and sports related niches. 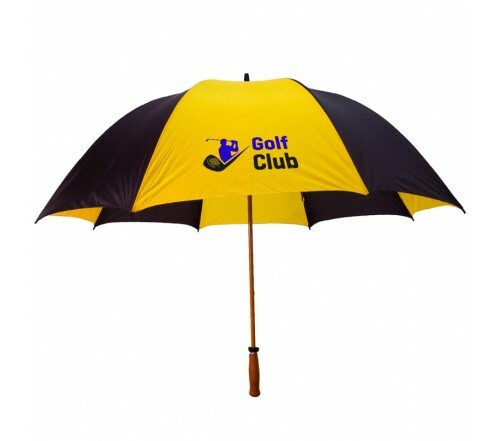 Custom black & marigold 64” arc mulligan golf umbrellas score on the terms of high service life because it is made up of sturdy fiberglass shaft and ribs, and possess windproof duraflex construction. Wooden grain handles, and its large black & marigold canopy makes it a wonderful eye candy. Dimensions - 41" L x 2" W x 2" H.
Available Colors : Black, Brown, Burgundy, Hunter, Navy, Red, Royal, White, Yellow, Black/White, Burgundy/White, Hunter/White, Kelly/White, Orange/White, Purple/White, Red/White, Royal/White, Red/White/Navy, Black/Red, Black/Marigold, Black/Orange and Navy/Hunter. Product & Design Quality - Well-made, exactly what we wanted. Customer Service & Shipping - Customer Service was good, but shipping wasn't. They shipped a week after the date we were told they would be shipped and if I hadn't called on them, I wouldn't have known.